Women on a Mission: Mom Edition: MINI: WALMART POLICY=MORE SAVINGS! One of our fabulous followers Katie sent a couponing question. Katie is a new mom and author of the blog parventing.areavoices.com. Thanks for the great question. Keep in mind that Katie and I live in little city, ND (about 1.5 hours from Fargo). What exactly is a competitor? To find the answer I called our local Wal-Mart and spoke to a very friendly, very knowledgeable associate. She informed me that they will match competitor’s prices from Bismarck or Fargo (so for you out of state followers, according to our ND store—they will match up to 1.5 hours away (or maybe farther—I would encourage you to call your Wal-Mart for clarification). In addition, I asked about the type of store, for example will they match a Walgreen’s flier? And she said yes! THIS IS FABULOUS NEWS! This is going to equal HUGE SAVINGS! Thank you Katie for pointing out another FAB THRIFTY TIP! The Wal-Mart associate did encourage our followers to bring the competitor's sales flier in with them, but also said that they do have a copy of the Sunday Fargo Forum in the store (another reason to get a Sunday paper). My advice—research, research, research! In addition, bring the flier with you when shopping (it doesn’t hurt to be prepared). 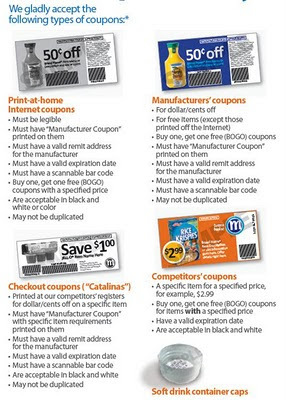 Followers: please let us know if you have any issues with the coupon policy. Also, please feel free to send more questions our way! Either comment on this post or send them to wommoms@gmail.com. PS - Don't forget to watch the new TLC show "Extreme Couponing" tonight. Lori and I will follow some of their tips and keep you informed on THRIFTY new tips as we discover them. This is soooo awesome! I am excited!!! We were just talking about how much more money we could save if we lived in Fargo!! I know...isn't that the truth. Now we can utilize Fargo prices here!